We can only guarantee that your ANDREA rosin is genuine if you buy from one of our authorised stockists listed on our stockist pages. We are in the process of adding new stockists so please check if you have any concerns. 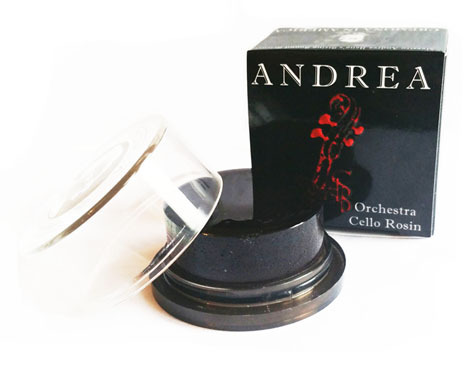 Each and every block of ANDREA rosin is made by hand in the USA from a select blend of the highest quality ingredients by professional New York violinist Peter Bahng. 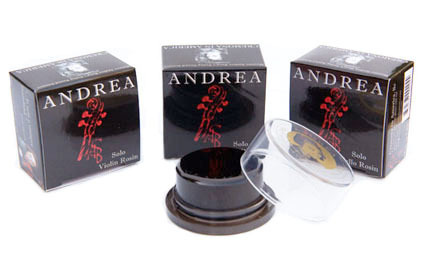 You might remember that ANDREA rosin was made by Andrea Bang several years ago under the name Tartini. 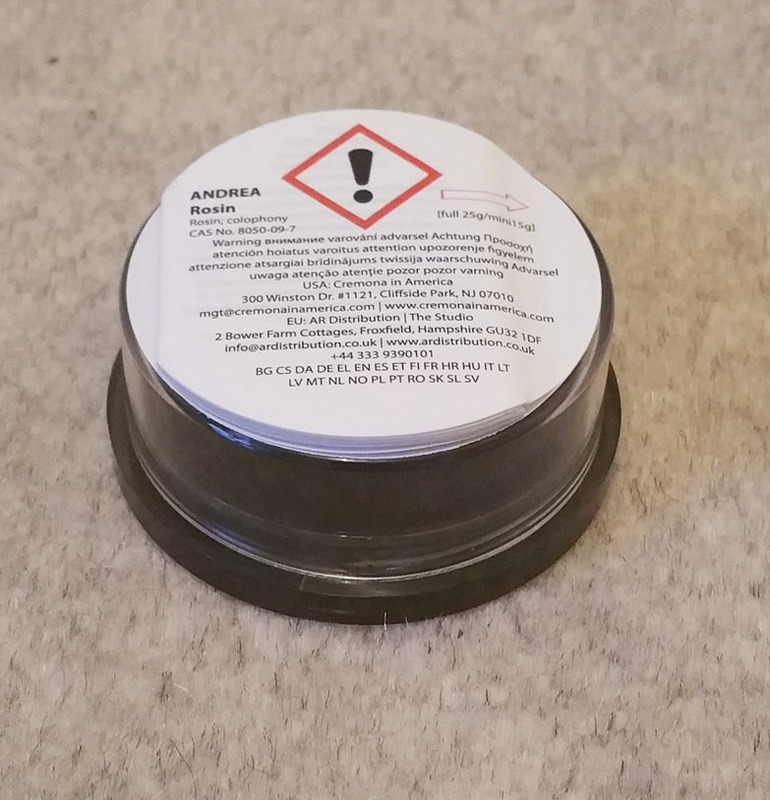 There's a very special new rosin from ANDREA launched January 2018. 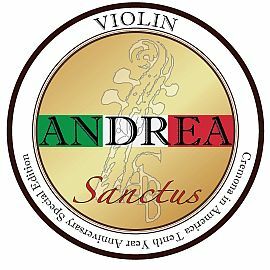 Sanctus celebrates the 10th year anniversary of ANDREA rosin under the direction of Peter Bahng. 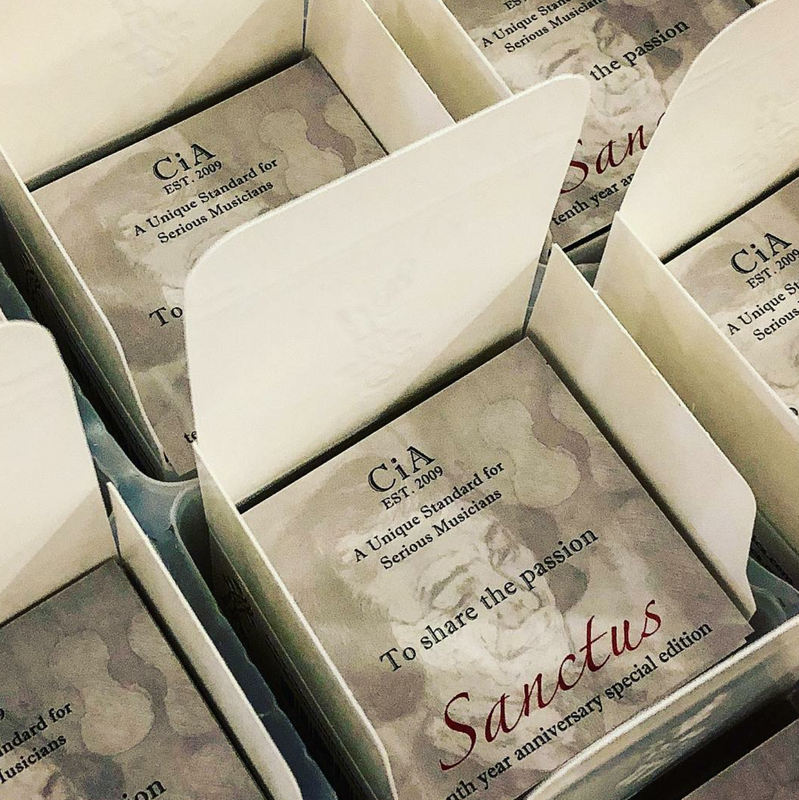 Sanctus is a unique formula that combines two separate parts in a single cake of rosin. The main base is hydrogenated to have excellent oxidation resistance. This ensures constant quality performance experienced throughout the long lasting life of this rosin. 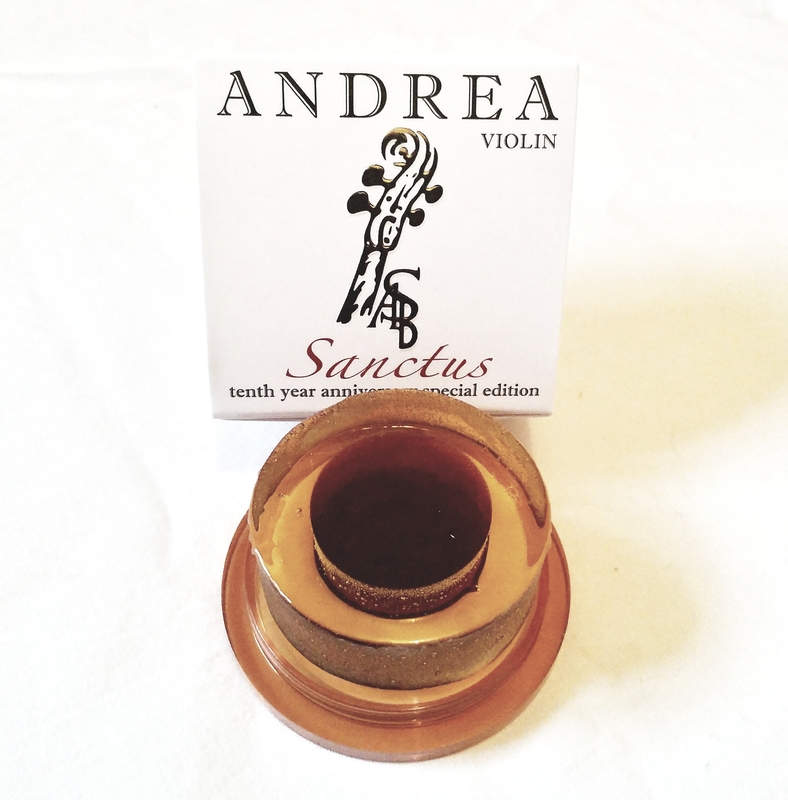 Sanctus - This unique combination of two sophisticated rosin formulas provides the optimum balance for sound and bow control. These formulas have been put into two separate areas in one special rosin cake to show the clear definition of their roles. The outer ring formula has been designed to give a silky smooth playing feel and to produce a focused sound on the strings. The centre formula responds and kicks in when the player demands more power and gutsiness from their instrument. The sound of these formulas when combined is noticeably more focused with enhanced tonal strength. Available in one size for violin, viola and cello. The violin and Cello Sanctus rosins are shown here. 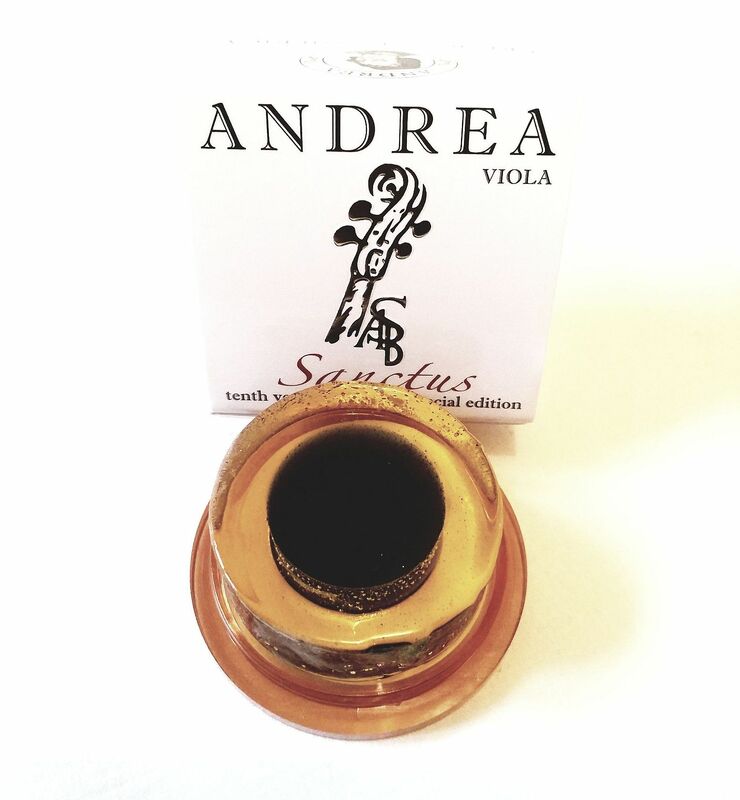 The inner core is a newly enhanced formula based on ANDREA's 'Solo' rosin. It is physically softer and thicker. The outer part is formulated to have harder and drier characteristics to generate the balance of sound and to protect the soft centre formula of the rosin. It is still hand poured which makes the rosin making process even more challenging. "Not just being instrumentalists but being true artists, we are constantly in search of something new, something different and something better to associate with what we create." "I work and hope for these artists to be inspired by what I create and then to create something artistically unique of their own." Colour of rosin - rosins come in different colours. Colours range from bright yellow to amber to dark brown and sometimes green. Most string players think that darker rosins are softer and stickier which suits cold and dry climate conditions, with light coloured rosins being the opposite. This can sometimes be true. However, this is not the case for ANDREA rosins or some other rosins on the market because they are formulated with other ingredients that have naturally different colours. There are also some rosin makers who add various colour pigments to their rosins. The very light colour in the outer ring of the ANDREA “Sanctus” is from the hydrogenation process. Relaunched in March 2011, 'A Piacere' Rosin was previously known as Tartini Green which was discontinued in 2004. 'A Piacere' has the exact same formula as the Tartini "Green". 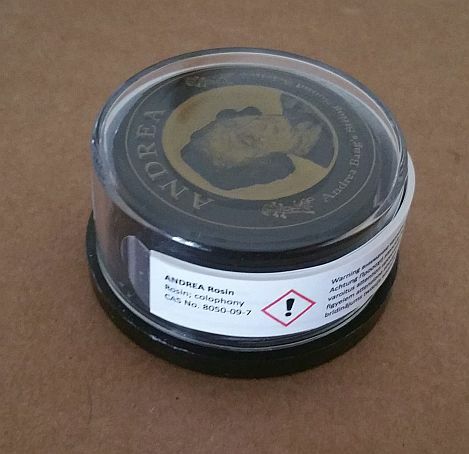 This rosin will get the most out of your instrument and add that extra something. One of the secret ingredients in A Piacere helps the bow hair make optimum contact to the strings and provides the effortless bow control with even sound production. Gives a pure, clean and projecting sound that soloists love. It has the widest dynamic range and is particularly good for playing in large halls.Solo rosin provides powerful sound projection, yet it does not compromise on the sensitivity for the soloist. It is also very forgiving without the 'sound cracks' on the strings under a high amount of bow pressure. You will not be overpowered in the orchestra. You will feel the immediate change in your sound. Solo rosins were previously known under the names Paganini for violin, David for viola, and Casals for cello. Gives a smoother sound that blends well in an orchestra without sacrificing clarity or articulation. The sound is more controlled. Orchestra rosin is formulated to provide more blending and warmer sound - without compromising on clear bow articulations - for the player to create a better ensemble. Some soloists prefer the orchestra rosin for the sound colour. Orchestra rosin was previously known as Symphony rosin and had the names Vitali for violin, Vienna for viola, and Toscanini for cello. All Standard sized rosins come in the boxed version shown. All small sized rosins are presented in the usual plastic case but without the cardboard box. 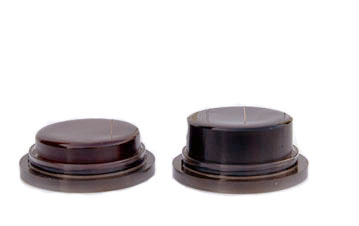 Both the standard and the small rosins are the same diameter but the small rosin is about half the height of the standard rosin. 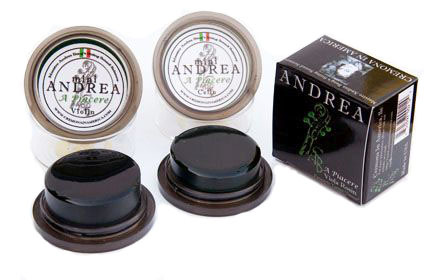 * Standard Size Andrea rosins are in a case which measures approx 5 cm in diameter and is 2.5 cm tall. The rosin block itself is approx 4 cm in diameter and 1.5 cm tall. Used by professional players, this rosin is worth every penny for the sound that it draws from your instrument. Many professional musicians won't use any other rosin and if you try it you'll understand why. Just 4-5 swipes of your bow over the rosin is enough due to it's powerful formulation, so it's economical too. Sometimes you will see small bubbles in ANDREA rosin. After the hot liquid rosin is poured into the mould, some bubbles are too stubborn to come all the way up to the surface of the rosin during the cooling process. So they set and can be seen. It does not result any negative effects on its quality of performance. In fact we like to think that it makes each rosin unique and individual. You might notice a slight pink (Solo and Orchestra) or green (A Piacere) tint on your bow. ANDREA rosin is a special formula that includes some rare tree saps from various regions. Some of them come in a stronger reddish brown colour depending on the season. The playing characteristics of the formula stay the same. There is nothing to worry about if your bow hair turns a little pink (or green for A Piacere). There isn't an ANDREA rosin specifically formulated for double bass. 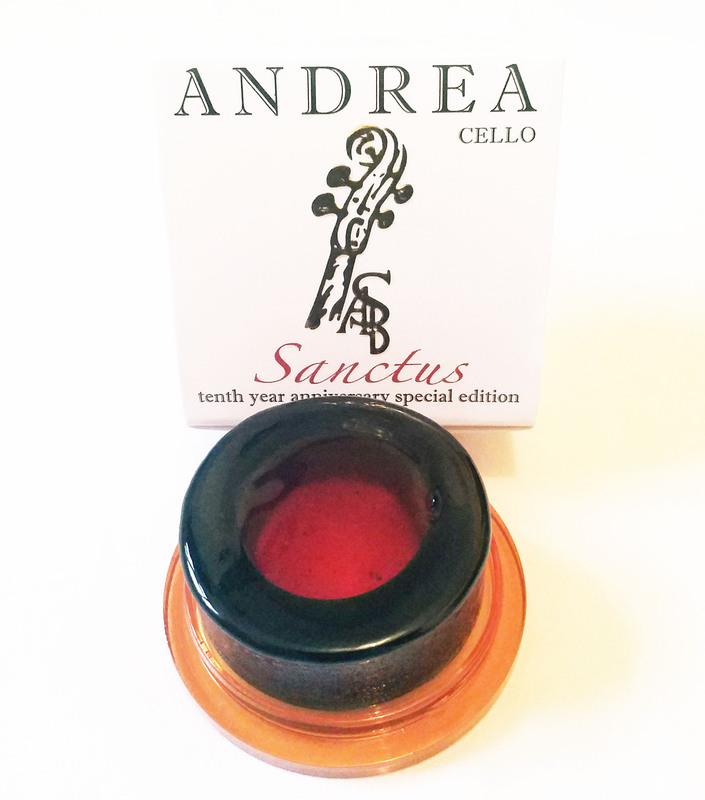 However, the ANDREA rosins for cello are highly recommended for use by double bassists. In June 2017 the EU labelling regulations (ECHA/REACH) changed. This meant that because there is no small item exemption any more, all rosins that contain rosin / colophony ought to be labelled as such with the relevant safety warning for colophony. ANDREA rosin most definitely contains a wonderful blend of rosins together with other special ingredients. So you will see that ANDREA rosin now wears a small multilanguage booklet label. ANDREA Kolophonium gibt es nun auch wieder in Grossbritannien sowie im restlichen Europa. Jedes Stück wird in den USA von Hand hergestellt. Es wird aus einem Gemisch von sorgfältigste ausgewählten Materialien und Inhaltsstoffen unter der Anleitung des professionellen New Yorker Violinisten Peter Bahng (Sang-Wook) hergestellt. Lesen Sie HIER die Geschichte von Peter's Vater Andrea Bang, dem Erfinder des Kolophoniums, einem ebenfalls berühmtenViolinisten. Vielleicht erinnern Sie sich, dass ANDREA Rosin vor einigen Jahren von Andrea Bhang unter dem Namen „Tartini“ hergestellt wurde (nicht zu verwechseln mit „New Tartini“, welches ein anderes Produkt ist). A PIACERE ROSIN: Das „A Piacere Rosin“ war früher bekannt als „Tartini Green Rosin“. SOLO ROSIN: Es erzeugt einen klaren, reinen und tragfähigen Klang, den Solisten lieben. Das ist keineswegs nur ein Marketingslogan - das Kolophonium ist wirklich phantastisch! („Solo Rosin“ war früher unter dem Namen „Paganini“ für Violine, „David“ für Viola und „Casals“ für Cello bekannt). ORCHESTRA ROSIN: Es erzeugt einen weicheren Klang, der sehr gut für das Spiel im Orchester beziehungsweise für Tonaufnahmen geeignet ist. Der Klang ist wesentlich kontrollierter. Das „Orchestra Rosin“ war früher bekannt als „Symphony Rosin“. (Außerdem als „Vitali“ für Violine, „Vienna“ für Viola und „Toscanini“ für Cello).